Sometimes, there's nothing else to a look besides comfort. I was definitely comfortable and didn't even feel like I had to change into my PJs when I came home, which is often the routine. I'm sure I'm not the only one who does that...right? Comfort and style together--great look! I love your new Birks! I think this is the first time I've seen Birkenstock that I like! I think it's the navy color . the tan & browns just don't do it for me. You are definitely not the ONLY person to change into PJ's after getting home from work. Sometimes I'll stop by a neighbors house to give them their mail that was in my mailbox, it will be you know 7pm and they're fully dressed and I think, at what age do you stop changing immediately into PJ's? I hope never, cause they are oh so comfy. You are DEFINITELY not the only one who does that! I put on a t-shirt the second I get home after work - I just love being comfortable. 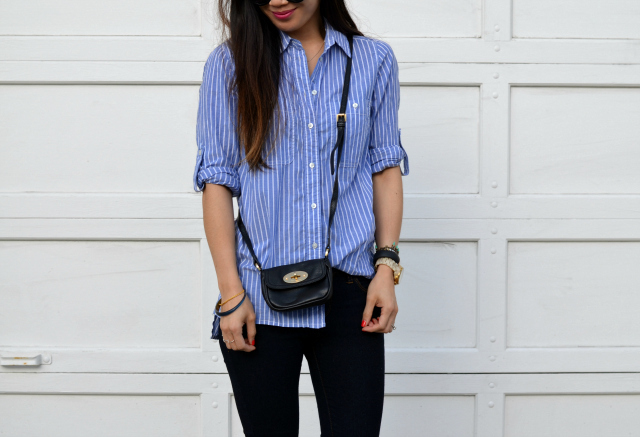 But this outfit definitely looks like something you can wear all day - I love the Birks! You make simple and comfortable look so chic. Loving that oversized boyfriend shirt. Not only does this look comfortable, but it's also really cute! An outfit that's so comfortable that you can lounge in it at home is a win in my book! now this style is my jam! Great outfit! Loving that top, bag and your birks. Really cute look Nancy. Your outfit is relaxed and casual but I'm not at all into Birkenstocks..
As soon as I get home I practically run to my closet to put on yoga pants and an oversized tshirt! I agree! Sometimes you just want to be comfortable but have that balance of looking fashionable too. Cute outfit! You can't go wrong with a striped shirt. I do always wear put on my pajamas when I come home from work. There's just something so comfy about an old loose tee for me. Great chic look! Man, how do you make these sandals look so good? I need to give this trend a try! I love this style you look amazing!! This looks great! I love the effortless cool vibe of this look. I need some of those sandals. I had some years ago but wore them down big time. Loving how chic and laid back this outfit is! So cute! Love this look. You know I love the Birks, and I have that same purse, used it this weekend!